Representatives of the Franciscan Order in Little Falls looked to Perham at the turn of the 20th century as a possible location for a health facility. 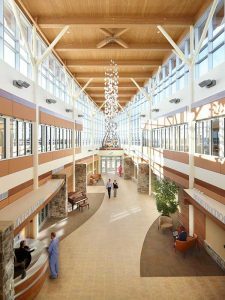 Originally named St. James Hospital, Perham Health was established in the year 1902, after an investment of $12,000 and a significant amount of donated labor. The Franciscan Sisters established traditions and ideals that are honored to this very day. Their dedication still inspires us, just as the values they instilled all those years ago still hold true. For over 60 years, the Franciscan Order ran the hospital and gave care to the neighboring residents. In 1968, the Memorial Hospital and Homes Association took over the hospital facilities and operations. The Perham Hospital District was formed in 1976 and is a governmental entity with a 14 member board of trustees. The board represents three cities, ten townships, and an at-large position. For the past century, many changes have been made to Perham Health. We have gained new services, doctors, innovative technologies, and facilities. We have also developed a vast network of medical professionals and services from our affiliation with Sanford Health. In order to continue to promote health and wellness, we began construction on a brand new facility in 2009. The $38 million facility covers 120,000 sqft and provides patients and their families with the support and care they need in a comfortable healing environment. We designed our building to support patient- and family-centered care, future growth, energy efficiency, and sustainable practices. The new Perham Health opened its doors in January 2012, during our 110th year of operation.